U.S. House members have been targeted by an "unprecedented number of threats," according to testimony by the U.S. House sergeant at arms. 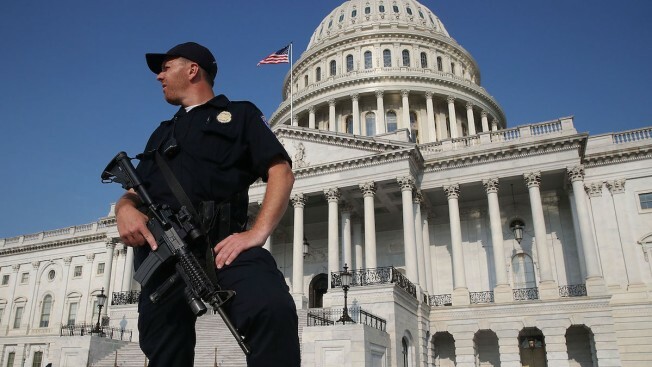 Nearly one year after a shooting spree at a baseball practice for Republican members of Congress, House administrators are under increasing pressure to bolster security off Capitol grounds. In testimony reviewed by the News4 I-Team, House administrators said at least 260 of the 435 Members of Congress added security equipment, including alarms or emergency buzzers, in their hometown district offices after the June 2017 shootings. "We know we can do better, so we are continuing our outreach (to members)," House Sergeant at Arms Paul Irving said. Irving said some members of Congress use private contract security vendors to help equip district offices, but may also use assistance from the House sergeant at arms office. A News4 I-Team review of federal court records shows a series of recent cases in which people made death threats against members of Congress through social media. A Roanoke, Virginia, man was charged this month with using social media to communicate threats against U.S. Rep. Bob Goodlatte (R-Va.). According to court filings by the U.S. Justice Department, Christoper McGowan wrote on Twitter, "I will do this in full belief I am defending the constitution of the United States. I am not making a joke. I will kill him. Should you believe my doing so would be illegal please arrest me so we can have this discussion in court BEFORE I actually do it." The I-Team also revealed a case in January in which a New York man was charged with stalking Rep. Kyrsten Sinema (D-Ariz.) in violation of two court-ordered injunctions that he not contact her. U.S. Capitol Police arrested Amos Olagunju after he appeared at Sinema's office at the Longworth House Office Building in Washington, D.C. According to court filings, Olagunju’s efforts to contact Sinema included 95 attempts to reach and “express his love” for the congresswoman in the summer of 2014. The affidavit said he made several other attempts to contact the congresswoman in 2015 and 2016, including a series of voicemail messages and by showing up at an April 2016 event in Chandler, Arizona, which Sinema attended. According to testimony at a U.S. House Appropriations subcommittee hearing, House officials said they have worked with U.S. Capitol Police to increase security screenings outside the U.S. Capitol complex to stop potential threats. The House sergeant at arms said his office will begin conducting site “surveys" at locations before members of Congress gather off Capitol grounds in the Washington, D.C., area. He said he ordered the surveys in response to the 2017 congressional baseball practice shootings, which occurred at a ball field in Alexandria, Virginia. Security was noticeably enhanced when the 2018 baseball practices began Wednesday, according to News4’s Chris Lawrence. U.S. House administrators are also increasing cybersecurity measures, according to the I-Team. House Chief Administrative Officer Phil Kiko said the congressional IT system is under increasing threat from cyberattacks. “Between July and December 2017, we blocked 9.4 billion unauthorized probes, scans and connections from the House network, and this year, the House had deployed nearly 200,000 security patches for servers and work stations for Members,” Kiko told a House panel. U.S. Capitol Police requested a budget increase to deploy dozens more officers for a force of nearly 1,900 sworn officers. The House sergeant at arms requested $18 million for its operations, including its security enhancements for House members.